This report by Vicky Nguyen, Liz Wagner and Felipe Escamilla of NBC Bay Area’s Investigative Unit aired May 12, 2015. Read the transcript here. I wish to submit the following comments regarding human health and safety concerns stemming from the proposed transfer of HPNS (Hunters Point Naval Shipyard) Parcels D2, UC1, UC2 and associated buildings 813, 819, 823 and IR 50 storm drains and sanitary sewer lines. In August 2001, I founded the Radiological Subcommittee of the HPNS Restoration Advisory Board and submitted comments to the HRA (Historical Radiological Assessment) iterations beginning in 2002 until publication of the Draft Final HRA in 2004. Additionally, I served as the attending physician for the Palo Alto Veterans Administration Hospital Persian Gulf, Agent Orange, Ionizing Radiation Registry in 1997 and as the health and environmental science editor of the San Francisco Bay View newspaper beginning in 2000. The Radiological Subcommittee of the Hunters Point Naval Shipyard Restoration Advisory Board played an instrumental role in advocating for Navy, public and regulatory response to radiation impacted structures on former Parcel A, slated for transfer to the City and County of San Francisco in 2004, including laboratories of the NRDL (National Radiological Defense Laboratory) and radiation contaminated storm drains and sanitary sewer lines designated IR 50. Additionally, I am concerned about potential radiation contamination from storm drains and sewer lines emanating from Building 813 on Parcel D2 that did not undergo excavation and disposal by the Navy as documented in the Parcel D2 FOST dated Aug. 9, 2010. The Naval Radiological Defense Laboratories were located along Crisp Avenue and included Buildings 816 and 821 on Parcel A and Building 322 on Parcel D. The HRA documents that scientists of the NRDL poured effluents of radioactive waste down laboratory drains of the main laboratories located along Crisp Avenue, communicating with the sanitary and storm sewer system, constructed in the 1940s to drain via conveyance piping and 40 separate discharge outfalls into San Francisco Bay. Parcel D2 was created in March 2004 when the Navy revised the southeastern boundary of Parcel A to exclude structures identified by the HRA as being radiologically impacted, including Buildings 813 and Buildings 819. Thus, adjacency issues are evident that challenge the U.S. Navy covenant warranting “all remedial action necessary has been taken” and its decision not to utilize covers or institutional controls at Parcel D2 (7.0 Covenants Parcel UC1 FOST). Hunters Point Shipyard Building 813 is a large, 262-by-262-foot, four-story reinforced concrete, flat-roofed building. My major concern about the proposed transfer centers on the U.S. Navy’s admission in the UC1 FOST Section 3.1 CERCLA, “No soil samples have been collected at the property for chemical analysis, except for samples collected for radiological removals.” Samples were not collected for other chemical constituents because “no known sources of chemical contamination are present” and soil conditions at the property can be represented by Hunters Point ambient levels (HPALS). “In November 1996 SFDPH (San Francisco Department of Public Health) sent a letter stating the Navy did not adequately address SFDPH’s concerns about lead based paint in soil. Soil at former residential structures on Parcel A were sampled during a 1993 LBP survey (TetraTech 1993a). Elevated concentrations of lead were detected in soil samples collected from former housing unit R-105. Hunters Point Shipyard Building 819 is a sewage lift station containing dry and wet wells, both approximately 20 feet deep. “It was resampled in 1997 and when the supplemental sampling was complete, the BRAC (Base Realignment and Closure) Cleanup Team reviewed all data on lead for Parcel A (1993-1997) with respect to the 221 mg/kg health based cleanup standard set by DTSC’s (California Department of Toxic Substances Control) blood level computer model (DTSC 1994). The average concentration of lead in soils across Parcel A derived from the 1993 and 1997 sampling events was 215 mg/kg (EPA 1998). Obvious concerns are raised by the known presence of asbestos containing material in Buildings 819 and 823. Remediation of ACM by the Navy is not required on buildings, structures, facilities scheduled for demolition by the transferee. Transfer documents prohibit occupation of buildings until ACM is abated or the building demolished and the transferee is responsible for ACM. In 1945, when this aerial photo was taken, the Hunters Point Shipyard was the nation’s center for radiological research. Some 20,000 people worked there, the majority Black people recruited from Texas and Louisiana and living in barracks on Hunters Point Hill that rises to the right, just out of view in this photo. CERCLA institutional controls will be implemented to prevent exposure to chemicals of concern in soil and groundwater on the property. It should be restated the Navy conducted no soil sampling on Parcel D2 for chemicals other than radiological contaminants despite the potential for lead and asbestos from demolished buildings being present on the base and known elevations in average lead samples approaching remediation standards. cc: Mara Rosales, chairperson, Commission on Community Investment and Infrastructure; Tiffany Bohee, executive director, Office of Community Investment and Infrastructure; Willie Ratcliff, publisher, SF Bay View newspaper; Veronica Hunnicutt, chairperson, Hunters Point Shipyard Citizens Advisory Committee Executive Committee; Mayor Edwin Lee; San Francisco Board of Supervisors; Elizabeth Wagner, NBC News. 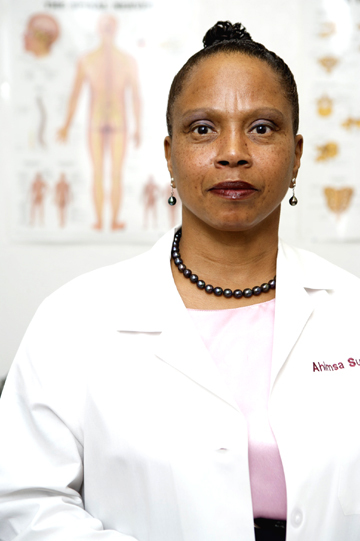 Ahimsa Porter Sumchai, M.D., founded and chaired the Radiological Subcommittee of the Hunters Point Shipyard Restoration Advisory Board in August 2001 and was an elected member of the Hunters Point Shipyard Restoration Advisory Board from November 2000 to June 2005. She can be reached at 415-859-5471. This letter was transmitted on April 30, 2015. Dr. Sumchai recommends that for an excellent, comprehensive account of the cleanup and redevelopment of the Hunters Point Naval Shipyard, you read “Hunters Point Shipyard: A Shifting Landscape,” a report of the Civil Grand Jury of the City and County of San Francisco 2010-2011. At the time of presentation to Commission on Community Investment and Infrastructure Building 823 does not appear on maps identifying radiation impacted sites at HPNS that appear in the February 16,2005 Basewide Radiological Work Plan published by the Navy Base Realignment and Closure Program. Please note that according to an article appearing in SF Curb today San Francisco accepted transfer of this property with three levels of federal regulators who were aware of the radiological fraud. https://sf.curbed.com/2018/3/13/17081188/san-fran…. Francisco DaCosta and I were the only two people who showed up at the Planning Commission Hearing to argue against this transfer!